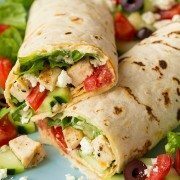 Greek chicken gyros are one of my favorite foods so I decided to create a simplified version of those that can be made into a easy weeknight dinner! 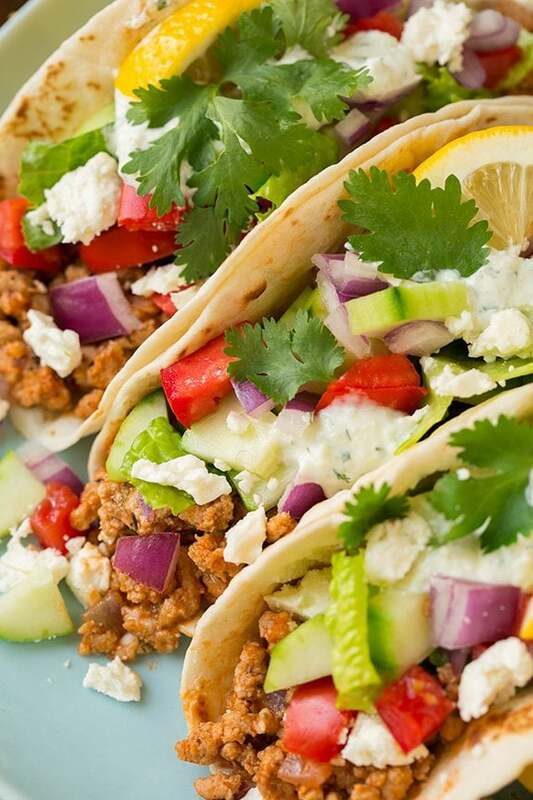 These Greek ground turkey tacos taste just like a gyro but they can be ready in 30 minutes! My husband and I couldn’t get over how good they were! This will definitely be making it to our dinner rotation! Even my kids polished theirs off. I love greek food not only for it’s amazing flavor but also because it’s usually packed with so many fresh, good for you ingredients and it’s not high in fat. These make for a delicious healthy dinner, and if you wanted to make them that much healthier you could do lettuce wrap tacos. 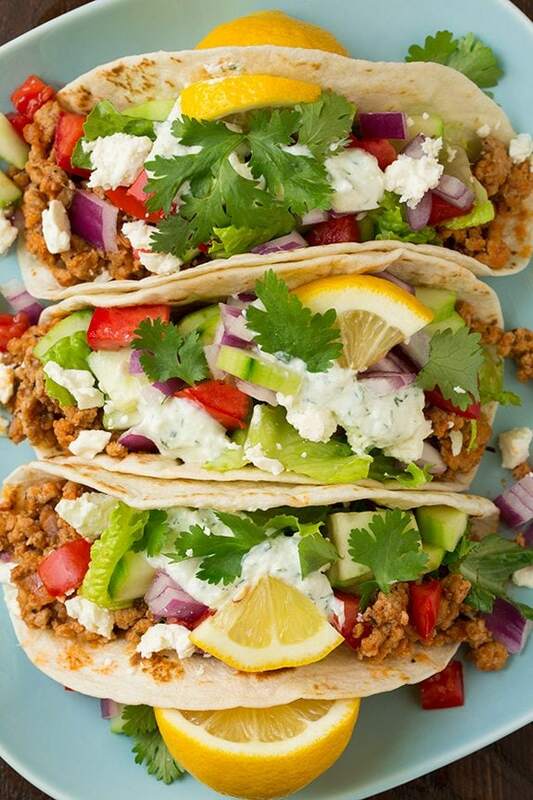 You don’t have to add everything I did for toppings, just like any taco add what you like – but I’d say the tzatziki sauce is a must! I also love the crunch the cucumbers add and the tang from of the feta – plus what’s a taco without cheese and tomatoes? I hope you love these as much as I do, they’re definitely being added to my list of favs! They reminded me a lot of my Chicken Gyros with Homemade Pita Bread but with far less work. Can’t beat that! 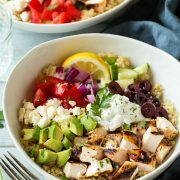 More Delicious Greek Recipes to Try! 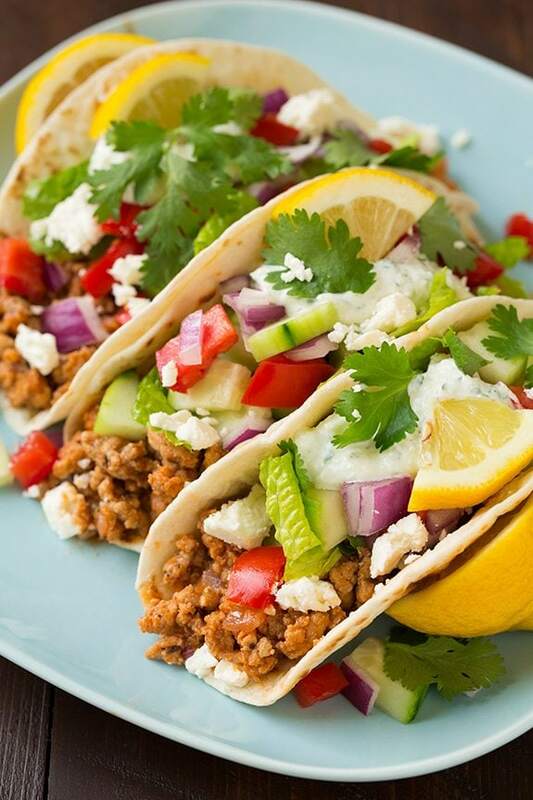 Easy to make greek tacos! They have the flavors of a gyro without all the hassle! Just be sure to load them up with veggies and tzatziki sauce. Add in red onion and saute 2 minutes then add turkey, season with salt to taste and cook, breaking up and stirring occasionally, until nearly cooked through. Then add garlic and continue to cook until turkey is cooked through. Stir in tomato sauce, chicken broth, oregano, thyme and coriander. Season with salt to taste. Bring to a boil then reduce heat to a simmer and cook uncovered, stirring occasionally until sauce has reduced, about 6 - 8 minutes. Stir in lemon juice. Serve warm over tortillas with toppings listed. Place diced cucumber in a mesh strainer or colander and sprinkle with salt, toss to evenly coat then allow to rest 20 minutes at room temperature. Rinse cucumbers and place over several layers of paper towels. Squeeze some of the liquid from cucumbers (almost as if wringing moisture from a cloth). Place cucumbers in food processor and pulse to chop fine. Dab cucumbers with a paper towel to soak up more moisture, then add in Greek yogurt, garlic, lemon juice, olive oil, parsley, and dill and season with salt to taste. Plus to blend. Store in refrigerator in an airtight container up to 3 days.